The Eufy RoboVac 11 and newer RoboVac 11S have been best-sellers on Amazon for a long, long time. They’re great robot vacuums available at great prices, so it’s easy to see why. In fact, the $230 Eufy RoboVac 11S is on sale for just $189.99 right now, so it’s the perfect time to grab one. If you’re looking for something that offers a bit more oomph when it comes to performance, though, Eufy has an even more powerful option available now. 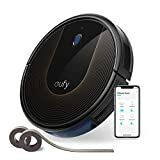 The new Eufy RoboVac 30C Robot Vacuum with BoostIQ Technology is slim and sleek, and it packs all the features you would expect from a top robotic vacuum. But it also has the most powerful suction Eufy has ever built into a vacuum, and it’s available right now on Amazon.